The many Americans who bear the distinguished name Stewart, or Stuart, must all look to Alan, son of Flaadd, for their origin. Alan, who died in the twelfth century, was descended on his mother's side from the earls of Mercia. It has also been said that Alan was a Norman who accompied William the Conqueror when he came to England, and that from this generous King he received a grant of Oswestry with the title of lord. However, that may be, it is a certainty that his eldest son, William Fitz Allen, remained in England and became the progenitor of the Earls of Arundel, while his second son, Walter Fitz Alan, went to Scotland where under David I, he became Baron of Renfrew and lord high steward of the Kingdom. Walter's grandson assumed this name Steward—with a final "t", in place of the "d"—as his surname. 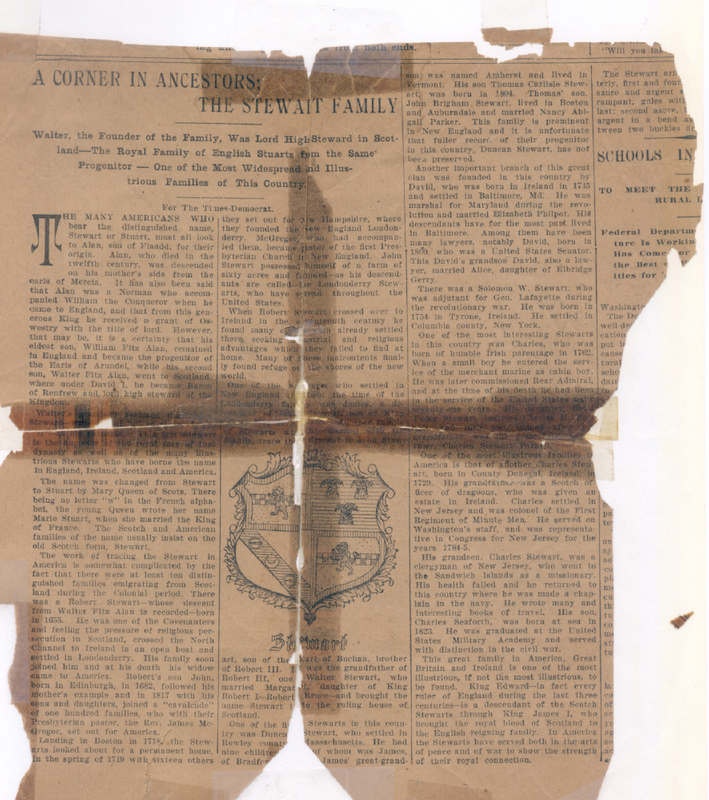 This first Stewart is the ancestor of the royal race of that dynasty as well as of the many illustrious Stewarts who have borne the name in England, Ireland, Scotland and America. The name was changed from Stewart to Stuart by Mary Queen of Scots. There being no letter "w" in the French alphabet, the young Queen wrote her name Marie Stuart, when she married the King of France. The Scotch and American families of the name usually insist on the old Scotch form, Stewart. The work of tracing the Stewart in America is somewhat complicated by the fact that there were at least ten distinguished families emigrating from Scotland during the Colonial period. There was a Robert Stewart—whose descent from Walter Fitz Alan is recorded—born in 1655. He was one of the Covenanters and feeling the pressure of religious persecution in Scotland, crossed the North Channel to Ireland in an open boat and settled in Londonderry. His family soon joined him and at his death his widow came to America. Robert's son John, born in Edinburgh, in 1682, followed his mother's example and in 1817 with his sons and daughters, joined a "cavalcade" of one hundred families, who with their Presbyterian pastor, the Rev. James McGregor, set out for America. Landing in Boston in 1718, the Stewarts looked about for a permanent home. In the spring of 1719 with sixteen others they set out for new Hampshire, where they founded the New England Londonderry. McGregor, who had accompanied them, became pastor of the first Presbyterian Church of New England. John Stewart possessed himself of a farm of sixty acres and founded—as his descendants are called—the Londonderry Stewarts, who have spread throughout the United States. When Robert Stewart crossed over to Ireland in the seventeenth century he found many of his clan already settled there, seeking industrial and religious advantages which they failed to find at home. Many of these malcontents finally found refuge on the shores of the new world. One of the Stewarts who settled in New England at about the time of the Londonderry family was James, a descendant of John Stewart, son of King Robert III of Scotland. Another family of Stewarts who intermarried with the Smalls, trace their descent to John Stewart, son of the Earl of Buchan, brother of Robert III. It was the grandfather of Robert III, one Walter Stewart, who married Margaret, daughter of King Robert I—Robert Bruce—and brought the name Stewart into the ruling house of Scotland. One of the first Stewarts in this country was Duncan Stewart, who settled in Rowley county, Massachusetts. He had nine children, one of whom was James of Bradford, Mass. 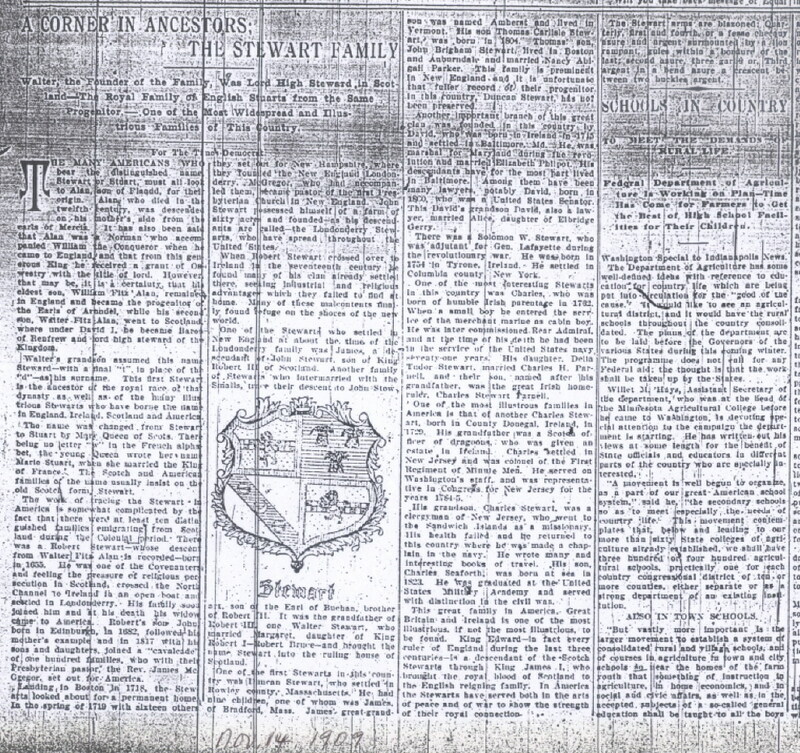 James' great grandson was named Amherst and lived in Vermont. His son Thomas Carlisle Stewart, was born in 1804. 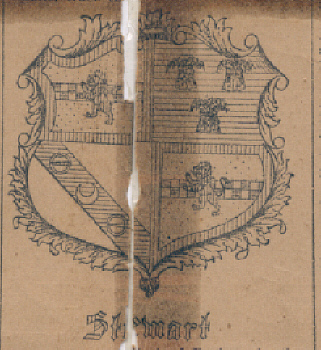 Thomas' son, John Brigham Stewart, lived in Boston and Auburndale and married Nancy Abigail Parker. This family is prominent in New England and it is unfortunate that fuller record of their progenitor in this country, Duncan Stewart, has not been preserved. 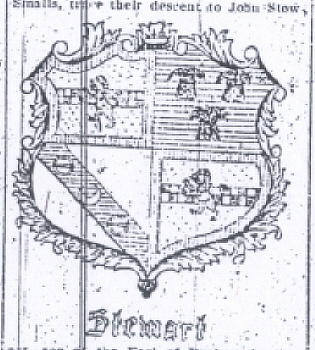 Another important branch of this great clan was founded in this country by David, who was born in Ireland in 1745 and settled in Baltimore, Md. He was marshal for Maryland during the revolution and married Elizabeth Philpot. His descendants have for the most part lived in Baltimore. Among them have been many lawyers, notably David, born in 1800, who was a United States Senator. This David's grandson David, also a lawyer, marrie dAlice, daughter of Elbridge Gerry. There was a Solomon W. Stewart, who was adjutant for Gen. Lafayette during the revolutionary war. He was born in 1734 in Tyrone, Ireland. he settled in Columbia county, New York. One of the most interesting Stewarts in this country was Charles, who was born of humble Irish parentage in 1762. When a small boy he entered the service of the merchant marine as a cabin boy. He was later commissioned Rear Admiral, and at the time of his death he had been in the service of the United States Navy seventy-one years. His daughter, Della Taylor Stewart, married charles H. Parnell, and their son, named after his grandfather, was the great Irish homeruler, Charles Stewart Parnell. One of the most illustrous families in America is that of another Charles Stewart, born in County Donegal, Ireland, in 1729. His grandfather was a Scotch officer of dragoons, who was given an estate in Ireland. Charles settled in New Jersey and was colonel of the First Regiment of Minute Men. He served on Washington's staff, and was representative in Congress for New Jersey for the years 1784-5. His grandson, Charles Stewart, was a clergyman of New Jersey, who went to the Sandwich Islands as a missionary. His health failed and he returned to the country where he was made a chaplain in the navy. He wrote many interesting books of travel. His son, Charles Seaforth, was born at sea in 1823. He was graduated at the United States Military Academy and served with distinction in the civil war. This great family in America, Great Britain and Ireland is one of the most illustrious, if not the most illustrious, to be found. King Edward—in fact every ruler of England during the last three centuries—is a descendant of the Scotch Stewarts through King James I, who brought the royal blood of Scotland to the English reigning family. In America the stewarts have served both in the arts of peace and of war to show the strength of their royal connection. The Stewart arms are blazoned: Quarterly, first and fourth, or a fesse chequy azure and argent surmounted by a lion rampart, gules within a boundary of the last; second azure, three garld, or Third argent in a bend azure a crescent between two buckles argent. Dated November 14, 1909, The Times-Democrat, New Orleans, La.